The first quarter of the year is always a busy period for TCB in the European Market. Traditionally, in these months, we participate in several trade and consumer shows in The Netherlands and in Germany. The New Year started with Vakantiebeurs in Utrecht, which was held from January 13-18, 2015. TCB exhibited in the Caribbean Village (Hal 4), one of the most attractive locations at the show. Vakantiebeurs Utrecht is the largest travel show geared towards Dutch tourists, with about 117,000 visitors in attendance. It presents a great opportunity to meet potential travelers, build relationships and promote our beautiful island of Bonaire. 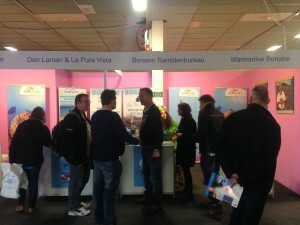 Every year, on the first day of the Vakantiebeurs, we organize our “Bonaire Moment”. At 2:00pm, all Bonaire relations and fans gather around the Bonaire booth to hear who has won the “Bonaire Promotie Prijs”. The recipient of this award is an organization or person(s) who has helped us promote the island and had greatly supported us in the prior year. We also hand out the “Roze Ei”, the award of “encouragement”. This award is for the organization or person(s) that is expected to do an outstanding job in the year ahead. For 2015, the “Bonaire Promotie Prijs” was presented to WNF. The “Roze Ei” went to surf brand Mystic. The trade day of the show is a very important day for Bonaire as it gives us the opportunity to network with travel partners, airlines, media and more. The Duikvaker show is the largest diving show in the Netherlands and Belgium and was held in the Expo Houten. 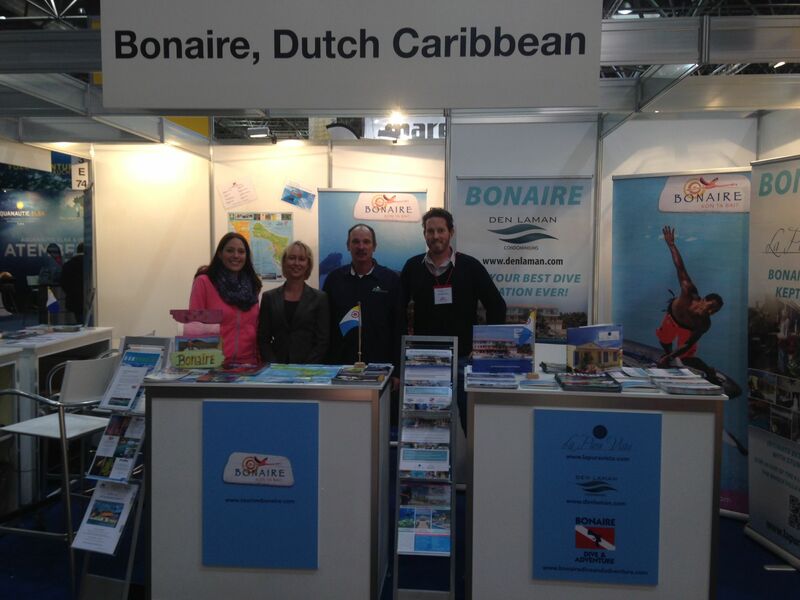 Its long standing history gives exhibitors the opportunity to connect with divers from Europe’s top target markets; the Netherlands and Belgium, which are vital to Bonaire. 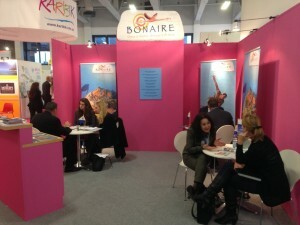 Many activities took place around the Bonaire booth and the attendees were speaking with all of the Bonaire representatives. 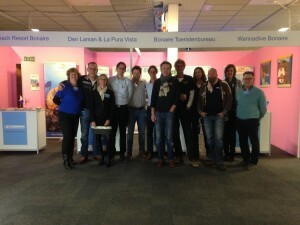 Several tour operators were present at Duikvaker, i.e. ABC Travel, BON Travel, Eigen Wijze DuikReizen and more. Bonaire was well represented by the private sector and Plaza Resort Bonaire, Den Laman/La Pura Vista, Sand Dollar, Wannadive, Buddy Dive Resort, Captain Don’s Habitat, Dive Friends Bonaire, and Bonaire Dive & Adventure were on-site. 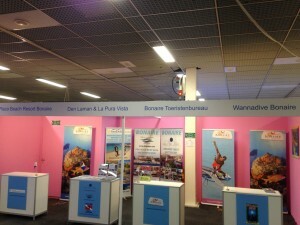 This year, there was also a booth that had information on “Bonaire Dive Week” to inform visitors about this event that is taking place in May for the first time. 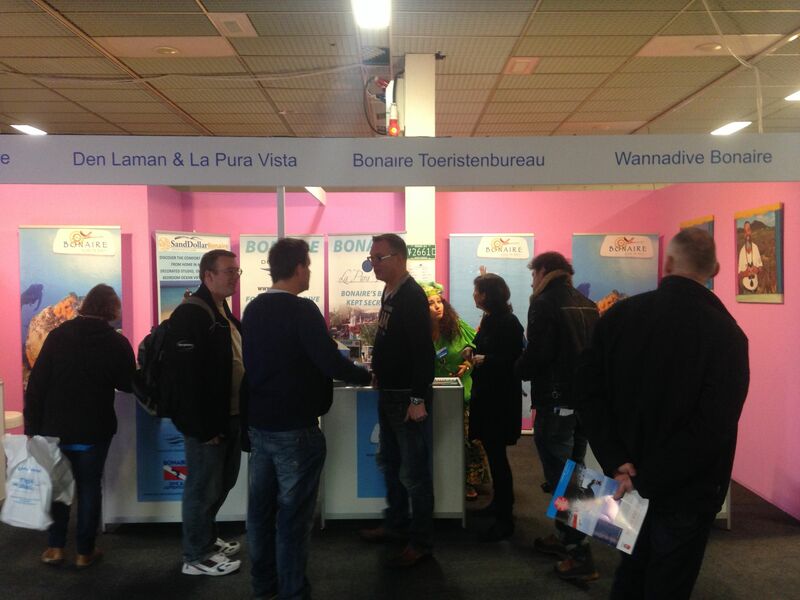 In 2016, the Vakantiebeurs will take place from January 12-17. The cost indication for participation is € 1000 for a counter in the Bonaire booth. In 2016, the Duikvaker show will take place from February 6-7. 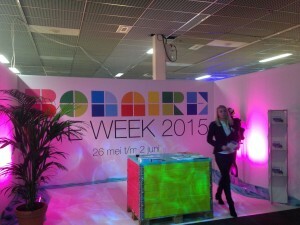 The cost indication for participation is € 1000 for a counter in the Bonaire booth. This year, TCB once again participated in the BOOT Dusseldorf show which took place from January 17-26. BOOT Düsseldorf is one of the largest water sports fairs in the world with approximately 250,000 attendees each year who come to learn about all that’s new in the water sports industry. Traditionally, the diving hall is the largest and focuses only on diving. All major dive tour operators, dive media, dive schools and of course diving destinations are present. The German market (and other European) divers can get all the information they need, on-site, about diving over the nine-day period. 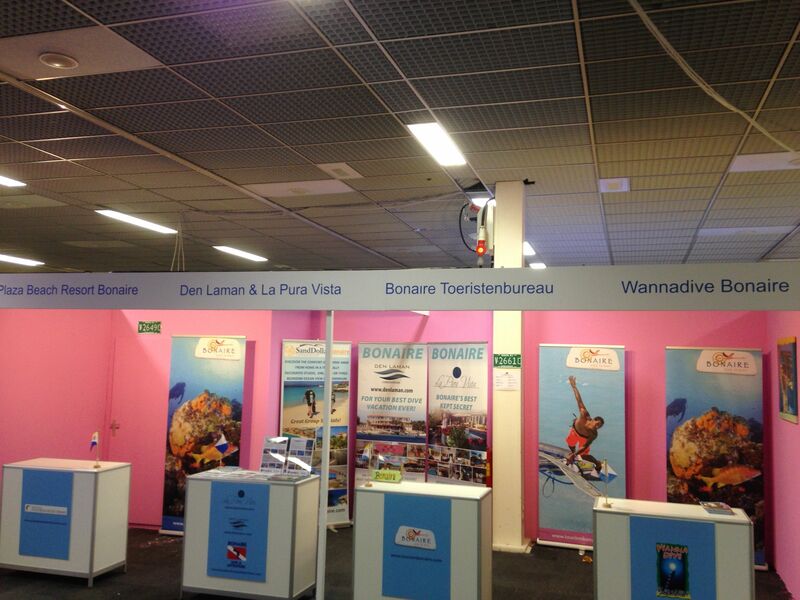 In the Bonaire stand there were several representatives from the private sector: Den Laman, La Pura Vista, Sand Dollar, Dive Friends Bonaire, Bonaire Dive & Adventure and Divi Flamingo go Beach Resort & Casino. In 2016, the Boot Düsseldorf show will take place from January 23-31. 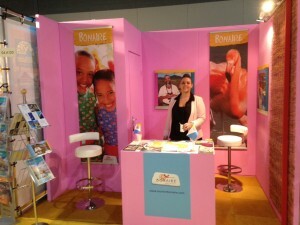 The cost indication for participation is € 1000 for a counter in the Bonaire booth. 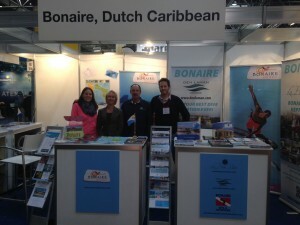 Bonaire was well represented this year at ITB Berlin, Europe’s most important trade show, which was held on March 4 to 8. Several members from the private sector were on-site and together with TCB’s representatives held numerous meetings and discussed the possibilities of working with additional tour operators, promotional programs and activities scheduled to take place during the year. Throughout the show, TCB had appointments with several new tour operators, airline representatives, journalists and other industry partners.